A further consultation event was held in the Library on 13 Septmber 2017 and over 100 residents visited. The materials will be available in the Library until the end of September and then from the Parish Office. The notes from the latest Steering Group meeting, held on 14th September are attached at the bottom of the page. Shropshire Council approved the proposal to submit an outline planning application for the site at a Cabinet meeting on 27 September. There will be a formal consultation on the outline planning application and residents will have an opportunity to comment. A Consultation Event was held in the Methodist Church on Saturday 16 November 2013 for residents to come and comment on the inclusion of the Glebe field as part of the development of the Oaklands site. The event was well attended and the results are attatched to the bottom of the page. In January Shropshire Council began a series of steering group meetings led by an Area Commissioner to assist the progression of the Development Plan for the site. As you may be aware the Diocese of Lichfield have offered the Glebe field as part of the potential site and they are attending the steering group meetings along with representatives from Shropshire Council, Bayston Hill Parish Council, Christchurch and Bayston Hill Scouts and Guides Group to assess whether there is any benefit in making it a joint development. Whilst we still don't have a date for when the Development Plan will be completed we know that the views of residents, as agreed at the Working Group meeting held in December 2012, will be incorporated into it. Once we have a Development Plan there will be further opportunity to consult with residents. The Steering Group are working together to achieve the best solution and we will keep you informed as soon as we have any further information. At a meeting held on Tuesday 4 December 2012 a number of residents got together with the Community Action Officer and representatives from the Parish Council and Shropshire Planning Department and the following documents were produced detailing the community wishes for the site. These will be taken away and used by the planners to produce a design brief that, once accepted by Bayston Hill, can be used to show prospective developers how the residents of Bayston Hill would like the site to be developed. 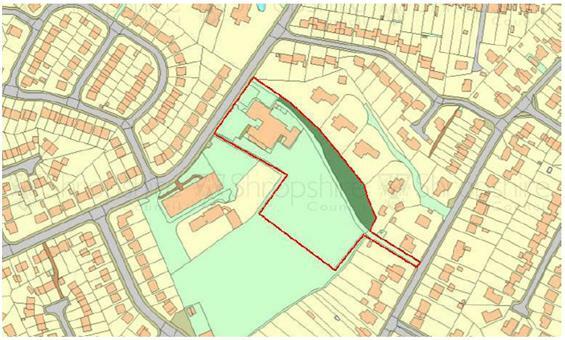 Shropshire council owns the former Oaklands school site which is made up of the building and school field. The Oaklands school site was earmarked for disposal in the spring. Disposal means that the school site and school field are able to be sold for development as it is no longer in use as a school. The capital from the sale will go back into the Education budget. Steven Caplan is the Consultant tasked with the disposal of the site. There is approximately 2.86 acres for development. This could potentially provide 20-30 dwellings - the size or type of development has not been decided, nor has instruction been given to market the site to developers. Assisted dwelling -a single bungalow for 3 persons with external funding to build is planned for the site. Process - Prepare a development brief, agree with stakeholders, appoint agents take to the market, secure best bid, obtain cabinet approval, obtain Secretary of State consent, planning, sell, build. There is an opportunity for some innovative mixed use for this site. LJC meeting in October 2011 - discussion on the Parish Plan gave indication that people were still interested in site's future. Responses included move library to Oaklands site and connect IT facility, put events on at Oaklands, Doctors, dentist, and opticians. Parish Council asked for residents thoughts on the site via 'The Villager' magazine. Parish 'hub', library and parish office , relocating the library with customer service point and associated facilities, allotments, community orchard and gardens, retaining sports field development of existing school building to house community activities for young and old, therapeutic and educational facilities, children's play area, site for retirement accommodation, sheltered housing, supported living for adults with disabilities. A 'Drop-in session was held on 18th September 2012 at Oakmeadow School for the Parish council and Shropshire council to share information on the site and ask for resident's thoughts and aspirations on the type of community facilities could be added. Ideas include relocation of library with caf?/ meeting room(s)/reading room, parish office, green space, play area, Space for youth club, scout hut, allotments, retirement housing, affordable homes, mixed homes. All the responses are available for viewing. At this point there is no definite plan for the site - this will be dependent on developer interest and the community's views and ideas are forming the starting point for the process and residents will still have the opportunity to share views and encouraged to have an involvement. The process for the development of the school site is only in the early stages. Feedback from residents is that they would like to be kept regularly informed - The Parish council will be working closely with Shropshire Council to ensure there are regular updates and involvement. For those in the community wanting to stay involved on a regular basis, the Parish Council will be organising a meeting to look at how things need to progress and be achieved. In order to make sure as many people are kept up to date the Parish Council will share information via The Villager, in the Library, Parish office , Parish website and LJC website - if there are other methods of communication that residents would prefer please make them known. The freehold of the former school, as indicated on the plan attached is owned by Shropshire Council. What are the restrictions on the title? There are a few minor restrictions on the title, but nothing that would prevent or have a detrimental effect on a sale or development of the site. The site is currently let to the Methodist Church; they are fully responsible for the site at present. Why is the Council now proposing to sell the site? The Council's Learning and Skills team have declared the school surplus following the local amalgamation and building of the new school facility. The Council requires the capital receipt to continue its funding in capital projects within the County and specifically for educational purposes. How will the site be sold? The Estates team are instructed to dispose of the asset. They will shortly be procuring the appointment of external, local commercial agents to sell the site. The actual method of sale has not been determined but it is unlikely to be by way of public auction. The process will most likely be by "private treaty". We have heard mention of £1 000 000, is that what the Council will sell the site for? The capital investment projects (in education) within the County are budgeting to receive £1 million from the sale. However, the actual price and value will be determined by the free market. The Council has a legal obligation in protecting the public purse and to obtain the "best value" for its assets. What about the Glebelands will that be sold for housing? The Glebelands are not owned by the Council and while we have now received an approach from a local agent representing the Church, we have no plans to join with them in dealing with our asset. Is the Council really consulting with the community or have the decisions already been taken? There may be a perception that the fate is already sealed for the site. This is not the case. The only decision taken to date is that the site must be sold. The Council is very concerned that there is public engagement in the process and if some community facilities can be provided, out of a receipt above the capital needed for educational capital investment, then we are seeking to do that. What can we suggest for the site for the community? Anything! We will listen to all requests and then consider them in a balanced way as to what is going to be achievable, deliverable and sustainable. The final decision will be with Shropshire Council. Have you done a deal already with a developer? No. We have not been approached or spoken to any developers. The Council's tree officers have inspected the site and are recommending the protection of a small number of mature trees by way of Tree Protection Orders (TPO). What about the traffic if the site is developed for housing? Any future development will have to fully comply with both planning and highways requirements. The highways consideration will take into account the previous traffic and the proposed new uses when making their recommendations. What about the access off Lyth Hill road? We do not see this as being a vehicle access into the site, but this will have to comply with planning and any highways requirements. What is the process you are following? The Council has a protocol to follow when disposing of its assets. This is not part of the Council's constitution, but it does follow "good practice" and is open and transparent. The first stages of consultation involve senior officers who have already confirmed no requirements for this site. The next stage is the consultation with the local members. The next stage is key stakeholder consultation and this is the stage we are at with open events run jointly with the local Parish Council. The next stage is essentially to take the responses and compile recommendations from that process and report to the Council's Assets Review Board. It is likely from that a development brief will be prepared, after discussions with the Council's planners. That brief will be taken back to the Parish Council and available for further comment prior to being taken to the open market. So is the consultation over? No. This is not a statutory process so we can take comments at any time, however of course progress does have to be made and decisions taken. There has been no decision on demolition this would form part of an eventual planning application which in itself is a process that will require further local engagement and an opportunity for comment or objection. Who decides on the eventual sale? State will also need to provide consent for the disposal, although they have already consented for the closure of course. What replies, ideas and responses have you had so far? All the feedback to date is available from the Parish Council offices or from Shropshire Council. Keep in contact with Bayston Hill Parish Council. We also have available the local Shropshire Council Community Action Officer Lucy Roberts or Steve Caplan in the estates Team handling the process. You can also contact your local elected Member, Ted Clarke. The Council is also seeking to set up a Facebook page if possible.